Italo Calvino is one of those authors – like Graham Greene – whose works I devoured in my early twenties, and haven’t read much since. Calvino in fact has continued to publish new work regularly since his death in 1985, from the bran tub of unpublished and uncollected writings his relatives keep dipping into. I think it is safe to say that none of these will overturn the major works – If on a winter’s night a traveller, Invisible Cities, Cosmicomics, Marcovaldo, and so on. Then there is this book, which I recently remembered I didn’t finish first time around. Mr Palomar (1983, tr. William Weaver 1985) was the last book Calvino published in his lifetime. From that you might assume that this innovative author, forever progressing and never writing the same book twice, was at the apogee of his ingenuity. You would be right. It is a series of short pieces – twenty-seven in 111 pages – describing moments in the life of the title character. What to call these pieces: stories? Vignettes? Essays? Meditations, even? They do not really have storylines, but they do move forward, or outward, from the initial moment. 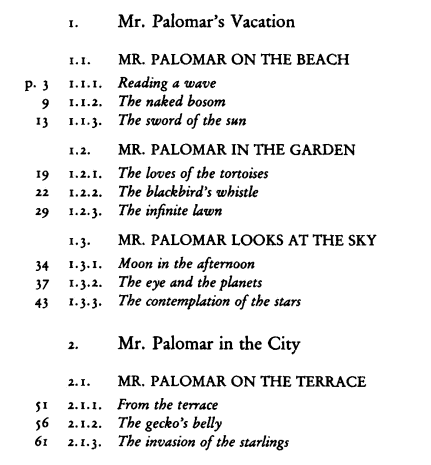 The character of Mr Palomar is crucial, yet sometimes seems little more than an observer from to which to hang the observations made in the piece. The best way of defining this book – beautiful, perfect, unique, challenging – for the wary browser would be to categorise it on the back cover as Fiction/Philosophy. This is a book of attention to everything. (Suddenly Nicholson Baker’s The Mezzanine, published five years later, doesn’t seem so novel.) Calvino’s comic lightness of touch is evident early on, from ‘The naked bosom’, where Mr Palomar is at pains to avoid looking at a young woman’s breasts as he walks along the beach. However, he realises that “my not looking presupposes that I am thinking of the nakedness, worrying about it; and this is basically an indiscreet and reactionary attitude.” He passes her again, worries more and tries in different ways to avoid looking, and to avoid avoiding looking. Eventually Mr Palomar has walked past her so often that the woman covers herself up and makes off, “as if she were avoiding the tiresome insistence of a satyr.” Elsewhere, Mr Palomar observes two tortoises mating, and wonders if their lack of sensory stimuli might “drive them to a concentrated, intense mental life, lead them to a crystalline inner awareness”? Inner awareness is what Mr Palomar wants, and he hopes to achieve it by increased consciousness of his surroundings. But he looks so hard that sometimes he cannot see what matters. Rather than enjoy it, he feels guilty when he cannot identify the bird a song belongs to. He feels he “must go and look at the stars … because he hates waste and believes it is wrong to waste the great quantity of stars that is put at his disposal.” Looking down as well as up, he contemplates his lawn: “the lawn’s purpose is to represent nature, and this representation occurs as the substitution of the nature proper to the area with a nature in itself natural but artificial for this area.” (Yes, there are many sentences in Mr Palomar that you need to read twice. Really, it is a book that you need to read twice.) He watches the daytime moon, “porous as a sponge”, solidify as night falls into a “lake of shininess … brimming in the darkness with a halo of cold silver.” As he considers the world around him, questioning everything he sees, he reflects that “perhaps it is this same distrust of our senses that prevents us from feeling comfortable in the universe.” He extends his discomfiture to mankind generally: to think as he does is to bring on unsettling uncertainties. Ignorance is bliss, if only he could see it. Viewing the index itself, then, we can see that the pieces in the book move from the purely visual and descriptive of natural forms (“1.1.1. 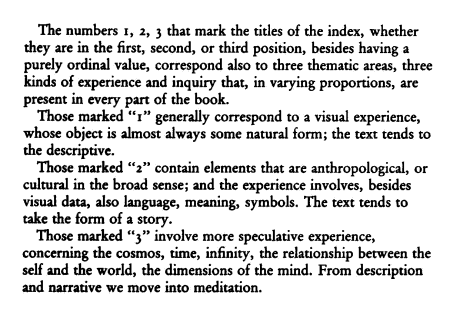 Reading a wave“) to a fully speculative meditation on the relationship between the self and the world (“3.3.3. Learning to be dead“). Each intervening story moves a little closer from the external to the internal. This is what we get in terms of character development. Mr Palomar may begin the book fully formed, as a man who needs order in a chaotic universe, but his personality, his curiosity and his innate sadness are gradually peeled down as we read more about him. His need for meaning is frustrated when he visits the ruins of Tula in Mexico. He knows that “in Mexican archaeology every statue, every object, every detail of a bas-relief stands for something that stands for something else that stands, in turn, for yet another something.” He knows that “every translation requires another translation and so on … to weave and re-weave a network of analogies.” (My own search for meaning made me wonder if this paragraph was a sly reference to Calvino’s longtime translator, William Weaver, with whom he collaborated on his English language translations. “I had problems with Calvino,” says Weaver, “because he thought he knew English.”) Yet he overhears a school teacher assuring his class, visiting the same ruins, that “we don’t know what they mean.” By this time in Mr Palomar’s story, we feel like smiting the teacher ourselves. Our hero, ever enquiring, never certain, is far slower to state his conclusions. In a time and in a country where everyone goes out of his way to announce opinions or hand down judgements, Mr Palomar has made a habit of biting his tongue three times before asserting anything. After the bite, if he is still convinced of what he was going to say, he says it. If not, he keeps his mouth shut. In fact, he spends whole weeks, months in silence. He opens his eyes. What appears to his gaze is something he seems to have seen already, every day: streets full of people, hurrying, elbowing their way ahead, without looking one another in the face, among high walls, sharp and peeling. In the background, the starry sky scatters intermittent flashes like a stalled mechanism, which jerks and creaks in all its unoiled joints, outposts of an endangered universe, twisted, restless as he is. this book, which I recently remembered I didn’t finish first time around. In my case I still wasn’t able to finish it at the third time of asking. I really don’t know how, though, as Weaver’s translations (at least for Calvino) brings a light, readable prose that is easy to gel with. Perhaps, it was the depth of the meditations at the time(s) I was reading, but then they were quite short in delivery. Either way, Calvino is a writer I want to catch up with again at some point. Clearly not finishing Mr Palomar is all the rage. I had similar problems with t-zero, the second book of Calvino’s Cosmicomics stories. But I think that those are in a different league of scientific – technical – difficulty. (Both Calvino’s parents were scientists and he had a lifelong interest in technical language, as William Weaver says in the Paris Review interview I linked to in the main article.) Mr Palomar is definitely worth persisting with, as it is a complete work which only makes its greatness known when you’ve finished it. Indeed, I really wanted to re-read it before posting this review, but as ever, other unread books seemed too urgent. I think you are right that your early twenties is the very best time to enjoy Calvino. I spent some years hitchhiking around the world with nothing but a sleeping bag and a copy of Invisible Cities in my coat pocket. I don’t remember liking If On A Winter’s Night… all that much but Invisible Cities is superb, and like you John I felt it begged to be re-read, but I pushed on to something else. This sounds wonderful, the quotes and your unravelling of Calvino’s method and ideas are hard to resist. The Weaver piece you link to is good stuff as well: lucky devil, what a life he’s had! Thank you – a great text! I believe “On a Winter’s Night … ” is the most important book I ever read, important in the sense that it was this book that made me study literature. 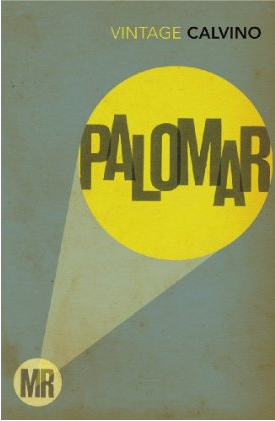 I also read “Palomar”, it must be at least 20 years ago, I think my experience of it would be different today from when I first read it. I’m reading most of Calvino’s work in Norwegian. I haven’t read Invisible Cities yet, so this will have to wait. It sounds interesting I admit. The index is rather appealing. Playful while somehow ludicrously overformal. I like that. Yes Max, Invisible Cities is the place to start. My memories of it are pretty fuzzy. Although it does have a linking character (Marco Polo), I do think Mr Palomar has greater unity as it ends up being as much about the character as what he experiences. 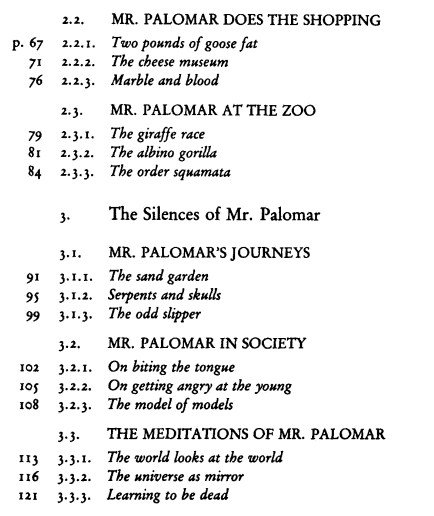 Mr Palomar is just plain wondrous. i still need to finish “winter’s night,” although i have read the description of entering the bookshop a hundred times at least, mostly to people into whose lives i am trying to introduce Calvino’s genius.